WatchOS 2 appeals to sausage-fingered types with its bigger, square keypad, and that’s quite cool by me, but isn’t its lack of a dialing functionality in apps like Messages and Phone quite a shame? This poses a major problem when needing to place a phone call from the wrist to a number you don’t have assigned to a contact. Watch Keypad by Dutch developer Rob De Ruiter, as the name suggests, solves this problem in one fell swoop. 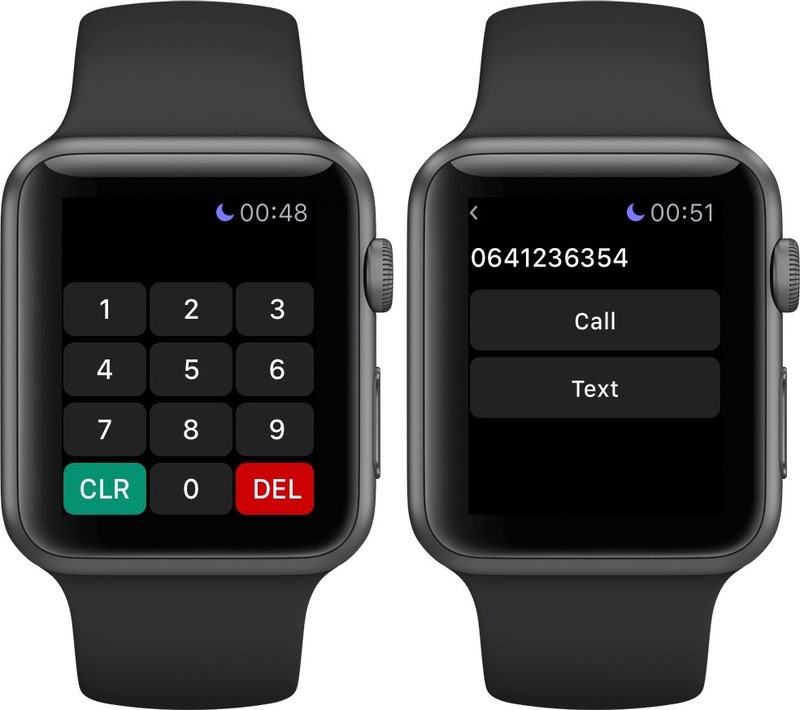 This app makes it real simple and easy to type a phone number to call from your Apple Watch, without any restrictions on contacts. 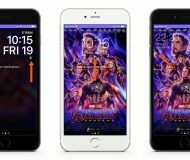 I spent some quality time testing Watch Keypad and will be using a lot going forward, here’s why. Watch Keypad is as straightforward as straightforward gets. Launch it and up pops a keypad with the usual numerical keys accompanied by a pair of dedicated ones: Clear and Delete. After punching in a phone number, just press the Apple Watch display firmly to reveal a pair of hidden options: Call and Text. Choosing the former initiates a phone call while tapping on Text sends a text message to that number. Your Apple Watch must be within the range of its connected iPhone as all phone calls are routed through your handset. 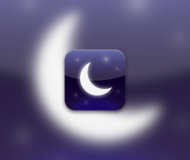 As for texts, typing in a phone number and selecting the Text option takes you to the watch’s stock Messages app. There, you can tap on Apple Watch’s canned responses, add animated emoji or dictate your message. 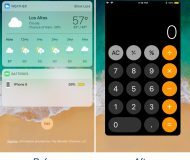 Also available in Touch Keypad by force-touching the display: a history of the recently dialed numbers and special symbols like the plus sign, asterisk and the star symbol. If you’re in the recent call list, force-touching the display lets you switch between recent calls and recent texts on your watch. 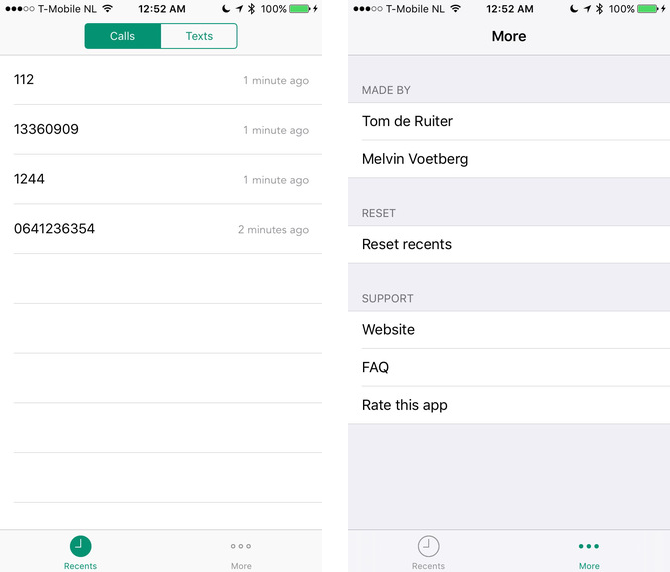 In addition to storing recents in Watch Keypad itself, the app automatically saves any phone numbers which you have called or texted onto your iPhone. As shown on the screenshot above, you can call any number within the Recents tab by swiping to the left and choosing Call or Text. To put the phone number on the system clipboard instead, tap on Copy. To refresh the times you’ve called or texted someone, pull to refresh in the Recents view. I would’ve liked the option to save a phone number to a new contact within the iPhone app, or add it to an existing contact. Keep in mind that your recents are not visible in the iPhone app unless the watch is within its connected iPhone’s range. 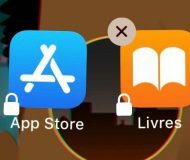 If your iPhone is connected and your recents are not showing up, try removing Watch Keypad from the app switcher on your iPhone. I’m not sure if Watch Keypad is a native watchOS 2 app or not, but it does feel responsive. Whether or not it’s worth 99 cents to you is a matter of personal preference. As someone who uses his Apple Watch to both place and receive a surprising number of phone calls, I’m disappointed that Apple hasn’t added dialing phone numbers to the stock Phone app in watchOS 2. Adding insult to injury, it is now possible to send messages completely hands free with watchOS 2. Can I imagine situations where calling unsaved numbers from my wrist would make my life easier? For instance, I often order food from restaurants but never store their phone numbers in my Contacts. The same goes for taxi services, various customer support phone numbers and so forth. Having said that, I’ll be using Watch Keypad on an everyday basis until Apple adds its features to the stock Phone and Messages apps on my Apple Watch. I actually don’t know why I started coding because before I started coding four years ago I didn’t know anything about computers, programming languages or Apple. Well, probably, my first iPod touch was the start. After a few weeks I got one, I became more and more interested in how iOS worked and how you could make apps for it. I actually started out with no knowledge of anything, and tried to create an app. Due to a lot of attention in the media (especially in Holland) because I was so young, I kept coding and taught myself all kinds of programming languages. 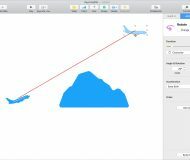 I began to enjoy it, because I knew how to make an app from scratch. And when I applied for a WWDC scholarship and met tons of important Apple persons, that feeling only became stronger. Of course, in those four years, I met a lot of awesome people who also convinced me to keep coding. And what were you doing when you were 14? 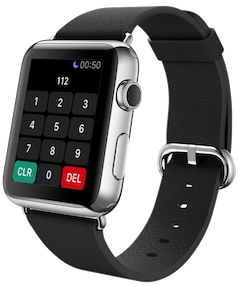 Watch Keypad, a 5.2-megabyte download, requires an iPhone with iOS 9.0 or later and any Apple Watch model with watchOS 2 or later. Grab Watch Keypad for 99 cents in the App Store.